Cornell University researchers have made DNA buckyballs — tiny geodesic spheres that could be used for drug delivery into cells and as containers for chemical reactions. These buckyballs are made out of a specially prepared, branched DNA-polystyrene hybrid. The hybrid molecules spontaneously self-assemble into hollow balls about 400 nanometers (nm) in diameter. Now this is the type of nanotechnology that interests me! I’m thinking of all kinds of possible applications…..
See also original paper in PLoS Medicine. This immediately made me think of Richard Feynman’s famous ‘Cargo Cult Science‘ address of 1974. In this he talks about the lack of scientific integrity in the pseudoscience he terms ‘cargo cult science’. However, I feel that what he says applies to any investigation. “…There is one feature I notice that is generally missing in cargo cult science…… It’s a kind of scientific integrity, a principle of scientific thought that corresponds to a kind of utter honesty — a kind of leaning over backwards. For example, if you’re doing an experiment, you should report everything that you think might make it invalid — not only what you think is right about it: other causes that could possibly explain your results; and things you thought of that you’ve eliminated by some other experiment, and how they worked — to make sure the other fellow can tell they have been eliminated. – Every year 130,000 people in the UK have a stroke – an average of one every four minutes. – Only one out of every three stroke patients make full recoveries. – High blood pressure means you are seven times more likely to have a stroke. – Binge drinking – eight or more units of alcohol for men or six or more for women at least one day a week – makes you five times more likely to have a stroke. – Smoking doubles the risk. Stroke can strike at any age. 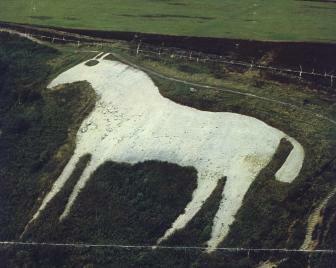 This is the most northerly of all the chalk figures and Britain’s largest white horse in surface area. It was finished in 1857, fell into disrepair after the first world war and was renewed in 1925. During the second world war it was covered, then was almost destroyed by a storm in 1949. Local mouse furniture maker Robert Thompson was prominent in keeping the horse well groomed until his death in 1955. The White Horse Association maintains the horse today in conjunction with local farmers. At one time I lived where I could see this white horse from my house — a sight I never tired of. 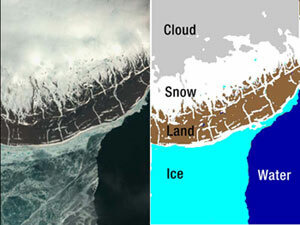 Spring thaw in the Northern Hemisphere was monitored this year by an Earth-orbiting NASA spacecraft carrying a new version of software trained to recognize and distinguish snow, ice, and water from space. I haven’t been to see the exhibition at Kew but a friend I visited this week has and absolutely raved about it. Nan likes Chihuly’s work too, I just saw some on her page. Is your house getting enough iron? The building runs a photosynthetic and phototropic skin made with spinach protein and produces more energy than a single family needs. More details: Cradle to Cradle C2C Home Competition. Noam Chomsky developed the commonly held theory that linguistic and mathematical mental processing draw on the same cognitive resources. This has been challenged by a team led by Rosemary Varley at the University of Sheffield, UK. Their study found that although aphasic patients were unable to decode syntax-based linguistic expressions (eg. could not distinguish between “the boy chased the girl” and “the girl chased the boy”), they were all able to perform equivalent mathematical calculations (eg. 90 30 and 30 90) accurately with pen and paper. Different processes underpin the grammars of numbers and language — suggesting that maths skills probably evolved independent of language. Thanks to moderntimes for a link that sent me off to look into this further. A new study of 42 non-human primates, looking at the origins of language, suggests that communication evolved hand-in-hand with social bonding. Strong relationships between vocal repertoire size and group size, as well as between repertoire size and the amount of time spent grooming were observed. This suggests that changes in communication could possibly facilitate changes in social behaviour. The researchers point out that there are radical differences between non-human primate vocal repertoires and human languages, so it does not follow that languages as complex as ours will necessarily follow from increases in group sizes and social interactions.